Yay! merry christmas guys, am so glad that we are gradually rounding off the year together, 2016 has been a wonderful year, i thank God for my family, my friends, studies, launching of my blog, and so many other good things that have happened this year. So guys, yet again another outfit pulled off by me to celebrate a wonderful christmas with you all even though christmas is being celebrated on the 7th of January in Ukraine (the main church is the orthodox they use the old 'julian' calendar for their church festivals) and yes i chose Warsawa hotel again; i love the place so much. 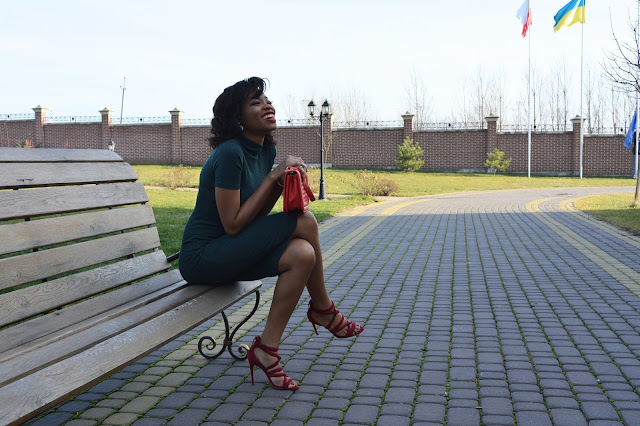 I chose to combine these colors cause they mark christmas,and being blessed that christmas fell on a Sunday i decided to have a unique look to church, so instead of the traditional red dress which is common to most people, i decided to go for a green dress with a light red bag and a dark red shoe to complement the outfit. hope you guys love it, be sure to write me if you do and i hope to see you all next year, once again merry christmas!